ARCADIA, California -- McKenna Brown, your record was short-lived. Gail Devers and Whitney Sisler -- you're still hanging in there. La Costa Canyon's Kristin Fahy finished fourth in Saturday's Arcadia Invitational 3200-meter run in 10:15.80 to erase the 10:15.97 clocked by former teammate Brown less than a year ago at the Escondido Invitational. Meanwhile, Coronado's Alysah Hickey took three tries at Sisler's section best of 5-11 but could not scale 5-11.25 in the high jump and hit 19-11.25 on her final attempt to capture the long jump, not surpassing Devers' 1984 mark of 20-7 while at Sweetwater High. Fahy set the record by running smart and not worrying about Illinois' Katelynne Hart's scorching pace en route to victory in 9:59.57. "I knew I'd die if I tried to stay with her," said the University of Stanford-bound Fahy, who led the second pack for most of the race until she was passed by state rival Meagen Lowe of Buchanan who ran 10:12.78. "After (Hart) took off, I had to think more of myself and run my race the way I usually run. The first few laps I was behind and bumped around which may have taken something out of me. I'm looking to break 10:10 at state-maybe even 10 minutes." Fahy said she hasn't done any real speed work and will stay local until the state championships the last weekend in May in Clovis. As for losing to Lowe, Fahy said that will light a fire under her the rest of the season. Meanwhile, when you're a multi-event competitor like Hickey, sometimes you have to make some adjustments. 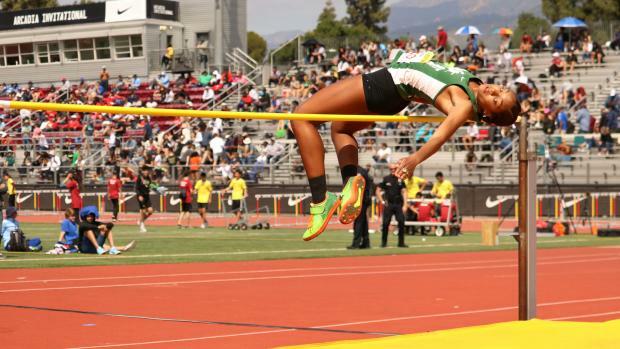 The University of Oregon-bound Hickey decided trying to long jump, run the 100 and high jump -- all within an hour -- would be suicidal. She'd spend just as much time going to and from events as competing. So, she entered the day portion of the high jump and did just fine, competing at her own pace. Leaving the rest of the field behind by clearing 5-7 on her second attempt, the state leader sailed over 5-9 on her first attempt and promptly asked the bar to be placed at 5-11.25. "The section record is 5-11," said Hickey by way of explanation. "But that isn't why I decided to high jump in the daytime. The long jump is at the exact same time and so is the 100, so any chance I get to focus on one event at a time, I take it. "I'll probably have to go from one event to the other at state but I probably won't be running the 100 there. This is a high-caliber meet and by high jumping in the day time, I could focus on both (the high and long jumps)." She eventually dropped the 100. Jessica Haney of Lees Sumit West, won the invitational high jump during the meet's evening session with a clearance of 5-08. Hickey, the state leader in the long jump with a legal 20-2 to go with a wind-aided 20-9, was in second place going into her last attempt and said she just relaxed and focused on hitting the take-off board for the first time. But the high jump was first and she was pleased despite missing out on the section record for the second time. "It'll come, hopefully at Mt. SAC," said Hickey of the meet where a year ago she improved three inches, clearing 5-10. "I love that facility. What was good today was by clearing 5-9, I know I'm real consistent there. Last year it was 5-7." She dragged 5-11.25 down with her legs on a facility that isn't very kind to the best of high jumpers. Crawford High's Nader Ali swears he'll be running the 1600 at the end of the season but he keeps posting good times elsewhere -- like in the 800 of the daytime portion where his 1:54.17 was the fastest. "That's pretty good," admitted Ali who bettered his lifetime best of 1:55.28 a year ago. "I started way behind but I just love racing these guys. I was nervous until everyone started dying while I realized I felt pretty good. "I've done no speed work-putting in the mileage-so I think I could run 1:52." Does that mean he's considering doing the 800 at the end of the season? "No, the 1,600 is still No. 1," he said, smiling. Rancho Bernardo's Jacey Farmer is just a freshman. Sometimes that's hard to remember. A soccer player who could run like the wind, she went out for cross country and was an instant success-the latest in a long line of multi-event Farmers starting with Occidental College legend Dixon and continuing with Monte Vista sensation Matt and then his son Josh, a decathlete at RB a year ago now at the University of Colorado. Jacey is still a neophyte on the track but she's learning fast. In the second-to-the fastest heat, she wanted to run a 73-second first lap of the mile but instead saw the clock click at 79 as she went past. A pedestrian pace. But it was the others who paid the price as she roared away from the field with a 68-second last lap to win in 5:03.67. That's close to a 5:01 for 1600. "By the end of the year, maybe I'll run 4:55," she said before leaving for another soccer commitment. "That's my goal-tops." San Diego High's Sonia Redon is dropping time just like she wants, clocking a 14.64 in the 100-meter hurdles. She said he wants to get under 14 soon and take aim at the section record of 13.41 by Cathedral Catholic's Dani Johnson in 2015. "I just committed to Cal," said Redon, who is planning to run but realizing she'll have to get well under 14 to get financial aid. The Helix 4x400 relay team shaved three seconds off its section-best mark to win its heat and finish fourth overall at 3:23.19. The quartet was Ty Sheridan, Denzel Mulligan, Nic White and Eric Parker.